My mom likes to collect things. She likes pictures and teapots and decorative items that have belonged to various family members. She hates to get rid of things because she gets sentimentally attached and besides, you never know when you might need it. My dad firmly believes that if you haven't used it recently (and recently is a very flexible time frame) then maybe you should get rid of it. He will happily give things away while my mom is still debating her sentimental attachment or whether it is needed. He does it in all helpfulness and kindness. When I was a kid I used to regularly find the newspaper by looking in the trash. He had seen it lying around in the living room and taken care of it, and besides, isn't everyone done with a newspaper by 9:00? I have both these mindsets battling for supremacy inside me. I hate clutter and dream of organized closets and an empty attic but at the same time, what if I need it next week? What if I regret getting rid of it? Plus I have a bit of a sentimental streak. If you tell me something belonged to my great-grandmother's second cousin twice removed I am probably going to want to keep it in the family. I think both my parents have realized I have these conflicted ideas about what to do with things and are using that knowledge to their own advantage. My dad knows I will understand his need to clean and organize so he offers me things out of their house with dismaying regularity. He has offered me a mini fridge and a microwave four times in the last six weeks. I am able to say no to these things because I am enough his daughter to refuse practical items I don't need. But then he goes in for the kill. He offers me things that used to belong to various family members. I am not totally confident that he doesn't slightly embellish the stories when he is telling me about these items. My mom uses her knowledge of me as well. She knows they need to simplify as they get older, she knows my dad is right when he says they need to get rid of things, and she knows the perfect solution for the things she can't bear to part with is to offer them to me. She isn't likely to offer me a mini fridge but she is very good at the family stuff. All she has to do is walk into the room holding some china and start to reminisce about my grandmother's pantry and I know it is all over. So last week when I stopped in to give my mom my opinion about a dress for a wedding I left with teacups and dessert plates and a sugar and creamer that belonged to my great-grandmother. 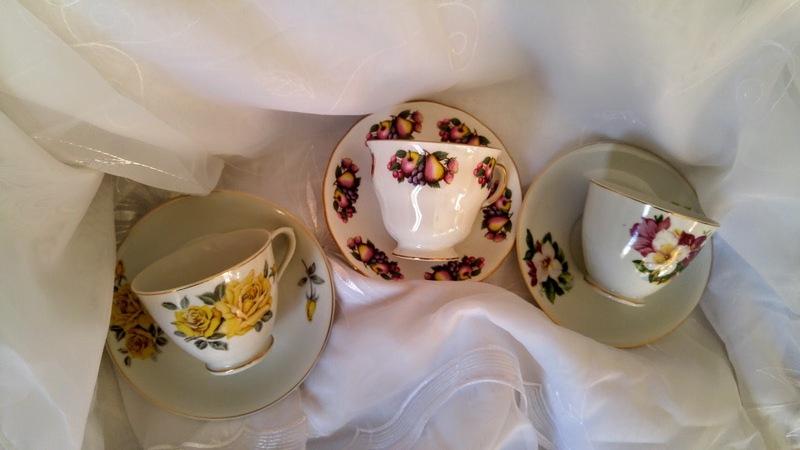 I knew I was doomed when she pulled out the teacups and then when we started talking about how I could have afternoon tea with my daughter I was completely sunk. I told you she knew what she was doing. You can see the teacups in the picture at the top. Aren't they pretty? The pink floral one is my daughter's, the fruit rimmed one is for me, and the yellow rose one is for a guest. I was only going to take two but she suggested one more just in case. She is sneaky. I went home with all three. Here are the plates. I took them because if my daughter and I are going to have tea parties then we need something to put our cakes on. That is my story and I am sticking to it. My parents also know that they can offer almost anything to me daughter and she will take it. Actually, both kids tried to convince me that they needed a microwave and mini fridge in their room. My dad thought that was a great idea. Of course he did. And now I am off to agonize over the things I should probably get rid of in my own attic. I have to make room for all the family treasures my dad is discovering. I'm so like that. I hold onto things I will never use because of sentimental value, but I also periodically get fed up with my house's clutter and go on a "big purge" (which results in a box or so of stuff I can get rid of). "What if I might need it" is a huge pull for me, too. Do your folks know anyone (church, neighbors, etc) who is going to college? Mini fridge and microwave could be greatly appreciated! I find it so hard to get rid of things that have sentimental value, and I attach sentimental value to way too many things! Last year I went through all my kids outgrown books and ruthlessly donated many of them. I kept particularly beloved ones and ones I might want to read to potential grandchildren some day (that is a little ridiculous, isn't it?) but we didn't need to keep every mediocre picture book they ever owned. I do have a struggle between the part of me that wants to keep everything forever and the part of me that just wants an organized house. Decisions are hard! Pshhht, no, that's not ridiculous -- I'm keeping books for my grandkids too, and Lord willing, I won't have any of those for another 15 years or so. 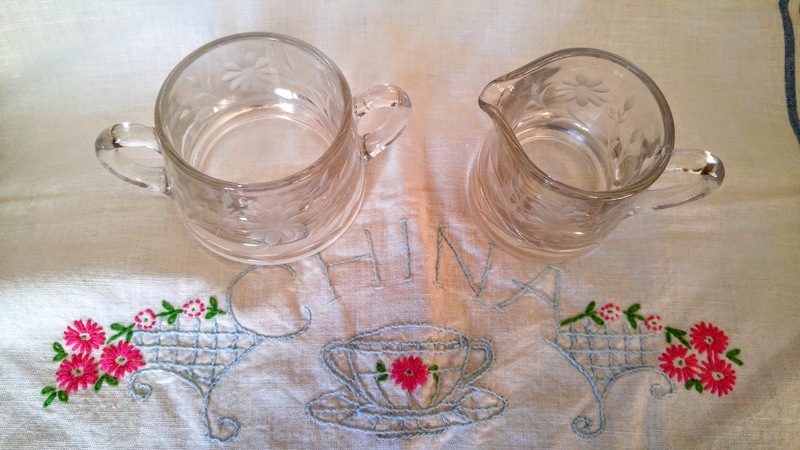 But family heirlooms - and china! The two together are irresistible, even if your mother isn't quite clear on all the details :) The mini-fridge and the microwave I could decline, but not family china. I love the cups and plates, and I volunteer as a guest. 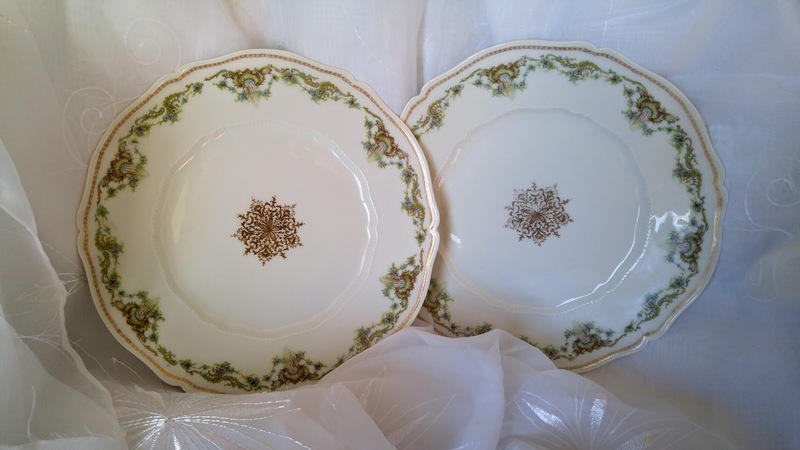 I know, I just can't say no to the family stuff, especially the china, and my mom has a lot more of it. I have a feeling it is going to work its way into my house.